Don’t get stuck with an unreliable and inefficient document management system when you can go digital and benefit from easier document access, quicker sharing and excellent security for your HR files. What benefits will a digital document management system bring for my HR department? In our blogs, we have frequently mentioned the cost savings, time savings and space savings along with increased efficiency and document safety benefits that come with document scanning and implementing a digital document management system. There are lots more benefits though and one of those is the increased flexibility of working with digitised HR files. 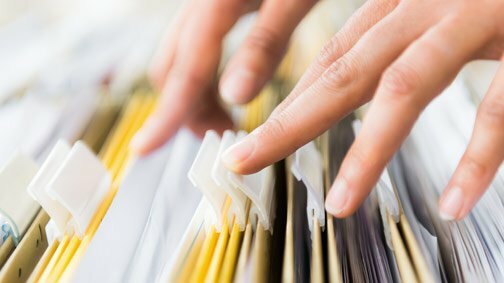 Electronic document management offers a range of different ways you can be flexible with the way you handle documents and work on a daily basis. One of the major advantages of having digital HR documents is having the ability to access them whenever and wherever you want. All you need is access to the internet (if you are storing them with cloud technology), the shared network or the mobile device, such as a USB, CD or DVD, you are currently storing them on. Digital documents completely eliminate the need for printing and sending paper-based copies if you want to share your HR files with relevant members of staff. Even for staff meetings, you can send the documents via email, and encourage staff not the print them, rather than photocopying up to 30 copies or more of the document which may well be redundant once the meeting is over. With the sharing of digital documents, potential clients are sometimes worried about the security of their files once they have been sent via email. Here at Pearl Scan, we appreciate your worries as personal data contained in human resource files needs to be secure which is why we offer file encryption and password protection for your documents. This means that your HR files will only be able to be accessed by those who have permission or the passwords. This is especially appealing as you wouldn’t get this kind of security from paper-based storage which is susceptible to loss, theft and damage. Working with digital documents is a lot more efficient and flexible than paper documents. You can edit a digital document in seconds rather than having to type out a document and print it again to amend one small mistake. Better organisation of your documents on the whole will let you have a more flexible approach to working, whether that’s accessing them from your iPad on the train or sending them to clients on the other side of the world in seconds. All of these factors come together to provide you with more flexible and efficient working. Combined with all of the other benefits we have mentioned in past blogs, it’s not hard to see why so many companies and organisations are turning to document scanning services to help them and their HR departments to implement digital document management systems. Scanning costs as little as a penny per sheet for large quantities so it won’t break the bank but it will relieve the worry of having to scan the documents yourself. You will get professional quality scans and great aftercare so what are you waiting for? If you would like some more information about the what we scan including HR file scanning, HR records scanning and or HR file management solutions we offer here at Pearl Scan including employee record scanning or if you would like to see more of the document scanning process, get in touch today or browse our website. To receive a free, no obligation quote for your scanning project complete the online form by following the relevant links below.